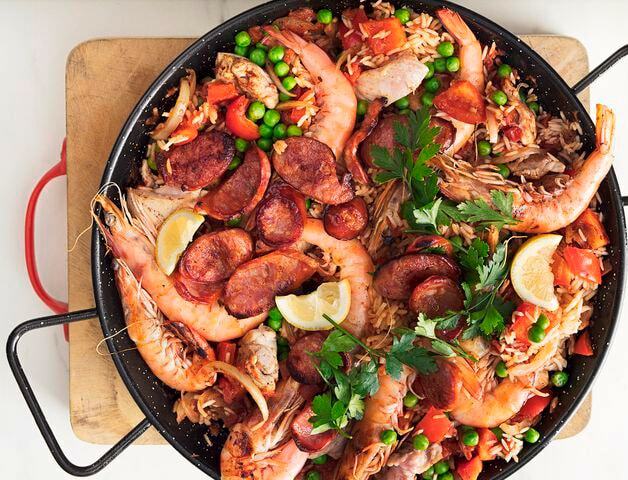 Traditionally, paella is made with short white rice, but replacing it with brown rice gives it a great texture and makes it a much healthier dish. The key to this paella with brown rice is saffron, which should never be replaced by food coloring. In addition to a nice yellowish color, it gives it flavor. The other ingredients must be very good quality ones for this dish to be a success. In a bowl, mix the oregano, paprika, salt, and black pepper. Chop the chicken and marinate it with the spice mixture, leaving it to rest for at least 15 minutes. After that time, heat the olive oil in a paella pan and fry the chicken until it is golden brown on all sides. When it has picked up color, add the chorizo in slices and stir, leaving it to cook for a couple of minutes, until the oil turns into a reddish color. Remove the chicken and chorizo to a separate plate. Reduce the heat and fry the finely chopped garlic and onion in the same fat until they are poached (about 5 minutes). Now you can add the crushed tomato and leave all the liquid to reduce. Add a little salt and black pepper and stir again. After the liquid is reduced, add the rice and stir well so that the grains are evenly distributed and then add the saffron. Pour in the water, stirring gently, just to make sure everything is mixed. Let it simmer for 15 minutes, stirring once or twice during the cooking process. Add the raw shrimp, increase the temperature until it comes to a boil and then reduce it as it was before, and let it cook for 10 more minutes until the shrimp turn pink. Meanwhile, crumble the chicken with a fork and add it to the paella, along with the chorizo, stirring gently. Continue simmering until the paella rice is tender, about another 5 to 10 minutes. Spread the peas over the top and continue cooking for 5 more minutes, until the paella is done. Remove from heat, cover to rest for 5 minutes, and finally sprinkle chopped parsley on top. And there you have it, easy and very tasty Paella with brown rice!